The first step of the longs awaited urban railway of Bergen is soon to be completed. The stops in this initial phase all take place in urban areas. The second phase, on the other hand, includes mainly stops in established residential areas. 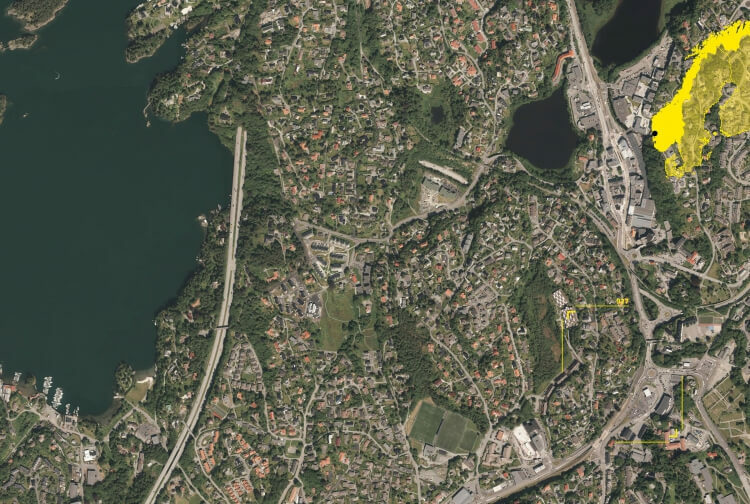 Aiming to contribute to urban transformation processes wherever it stops, the municipalities wants to use the railway to make Bergen a city of the future; not depending on cars for personal transportation. Consisting of single family housing mixed with small scale industry and heavy traffic roads, Skjoldskifte represents a challenge to this urban transformation. Due to a low economic pressure the existing components deviates hugely from the desired density. With the arrival of the urban railway this economic pressure is expected to explode. The time for grand architectural visions replacing existing structures has long gone. We need to accept that the main part of our future built environments has already been erected. Our vision for Skjoldskifte is about adjusting the existing structure, making a community, rather than a garden city, without tearing down a single house.